This earlier post, Hamilton as medium sized city in Netherlands, compared Hamilton NZ to medium-sized cities in the Netherlands and shows Hamilton is one of the most medium of medium-sized cities when compared to the Netherlands. This post will only look at Australia, which has about 24 medium-size cities with between 100,000 and 250,000 inhabitants. 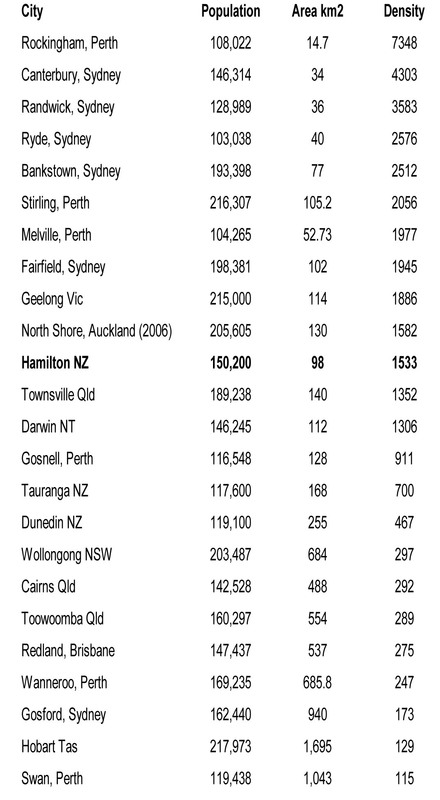 Only Geelong VIC, as an independent city, has a higher population density, at 1,873 people per km2 than Hamilton NZ. The table below includes cities inside cities, to show the range of choices a city provides for living. Perth is shown to have the greatest range of choice of for living, ranging from sprawling suburbia to medium density housing. Also included is North Shore City, which is the most densely populated and was the fourth most populous city in New Zealand prior to becoming incorporated into the greater Auckland Council. Cities are made up of different types of suburbs: it is the mix of old and new plus their different densities that give people a choice of lifestyles. Should we encourage something different?